Want To Keep Your Rosacea Redness, Dryness And Inflammation Under Control? Try This Skincare Routine! If your problem with rosacea is limited to conspicuous flushing, you are lucky. The disorder often takes on a more severe form that causes symptoms such as intense dermal dehydration and redness, visible and painful lesions, broken capillaries, extreme dermal inflammation and swelling as well as cystic acne. 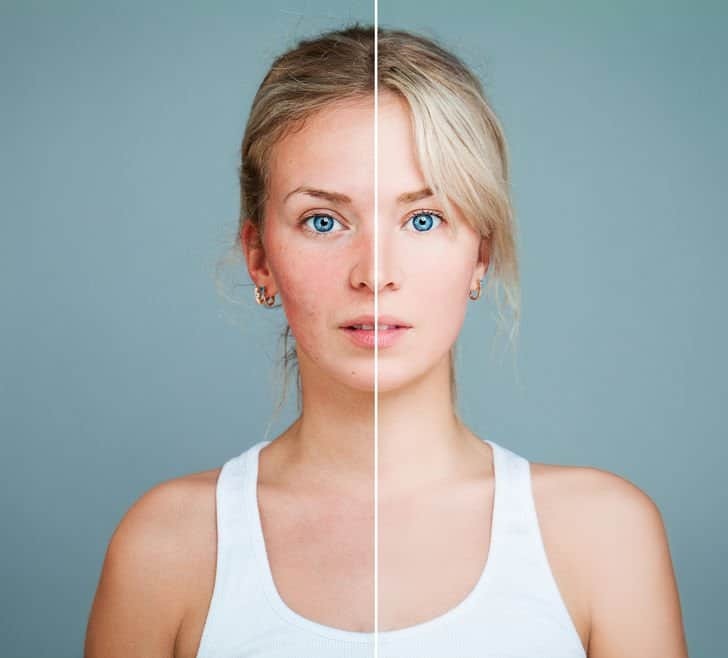 The problem with rosacea is that you can never say when you may go from a mild to a more extreme form of the condition. Moreover, triggers for dermal inflammation can be many and varied, including popular and completely harmless ingredients in skincare products. In fact, such is the fear of skin irritation that most will stay away from skincare products altogether or only make do with the most minimalistic skincare routine. If this has been your approach to keep your rosacea in control, you are harming your skin just as much as the condition itself. Actually, I’d go so far as to say that mild to moderate rosacea can be kept in check with the right skincare routine and products, without the use of prescription formulations. So, if you are done with all the blushing and flushing, here is what you have to do to beat rosacea into submission. The three pronged approach to keeping dermal inflammation and redness in control! If you also suffer from pimples caused by rosacea, you will need to add one more step to this plan: Keeping your pores clean and sebum secretion in check. That said, simplicity is the name of the game when you are dealing with rosacea, be it your skincare routine or the products that you are using. Start Your Day With This Simple 3 Step Skincare Regimen! The problem with rosacea skin is that it reacts adversely to the most innocuous of stimuli. Also, you may end up having problems with compounds and formulations that are considered beneficial. For example, a creamy cleanser used to alleviate skin dryness caused by rosacea may ending up leading to acne. Similarly, an AHA based cleanser meant to eliminate excess sebum and dirt can aggravate the flushing and inflammation. I would be putting it mildly if I say that you have a Catch 22 situation on hand. But, worry not! Where there is a problem, there is always a solution. In case of rosacea, the solution lies in all natural ingredients. So, when you are just up and about, splash some water (room temperature) on your face or if you want to jump right into controlling dermal inflammation, spray some helichrysum hydrosol on your face, wait for about a minute and apply about 2-3 drops of an anti-inflammatory carrier oil like hempseed while your skin is still damp. With this step, you will be set for all your morning chores. If you are the kind who goes from bed to the bustle of the workday, skip this step and go straight for cleansing which can be done before or after the shower. Regardless of the severity of your rosacea, it is best to stick to warm showers instead of hot ones if you suffer from the condition because heat is a major trigger. For cleansing, either use a creamy formulation meant for sensitive or rosacea prone skin or try a homemade mixture of raw honey, matcha and chlorella. Mix the powders with raw honey (manuka preferred) till you get a thick paste. The mixture will keep good for about 2 months even if not refrigerated as long as you don’t introduce water to it. To use, apply on damp skin as you would a mask. Go for thin layering and leave it on for 5 minutes. Wash with room temperature water and pat your skin dry. If you suffer from moderate to severe rosacea, you will need to wait for 20-30 minutes before heading to the next step. Depending on the severity of your symptoms, you can choose between an antioxidant formulation, pure hydrosol or a product that contains beneficial nutrients like vitamin C along with healing botanicals. Pure hydrosols are for those who experience significant burning and inflammation in response to most skincare products. If your skin is highly reactive, a cooling mist of roman chamomile hydrosol will help to calm it down. To get an added dose of protection, add ½ teaspoon of calendula extract to 50 ml of roman chamomile hydrosol. If you have mild rosacea, meaning flushing and redness are your only concerns with no discernible pain, go for an antioxidant and anti-inflammatory toner that will not only stop the redness but will also limit the skin damage it causes. 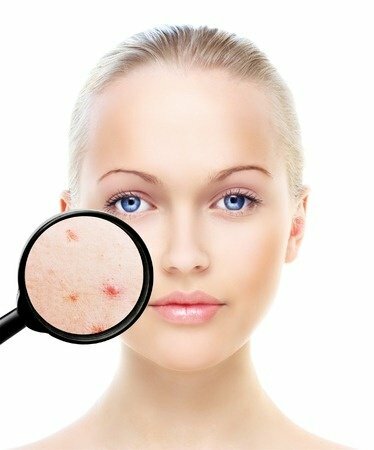 For those of you who also suffer from acne due to rosacea, a toner with vitamin C will certainly help as long as it also contains a medley of healing botanical ingredients such as aloe extract, glycerin, sandalwood and rosewood essential oils and humectants like squalene and glycerin. To tone your skin, soak cotton wool with the toner of your choice and dab it on your skin till your face and neck are drenched in the soothing formulation. Wait for about a minute and as soon as your skin goes from dripping wet to semi dry, you can reach for your moisturizer. A light moisturizer that will protect, without clogging the pores, works well on rosacea skin. You can either pick a formulation specifically meant for sensitive and rosacea skin or work with a homemade blend of soothing carrier oils such as those of hempseed, jojoba, camellia sinensis (tea seed oil not tea tree oil) blended with essential oils of rose, turmeric, chamomile, sea buckthorn, thyme and frankincense. You don’t have to use all the essential oils at one go. Pick two and add a drop or two of each for every tablespoon of carrier oil. This will get you a very mild blend that is just perfect for rosacea skin. To apply, do not massage the skin with the facial oil or moisturizer. Your rosacea afflicted face may feel violated with all that touching! Instead, warm the oil/lotion by rubbing it in between your palms and press your hands on your skin, covering your face and neck with the pressing motion. Move over each area 3-4 times and you will be done. Wait for about 15-20 minutes before applying your makeup. Dealing With The Triggers Through The Day! 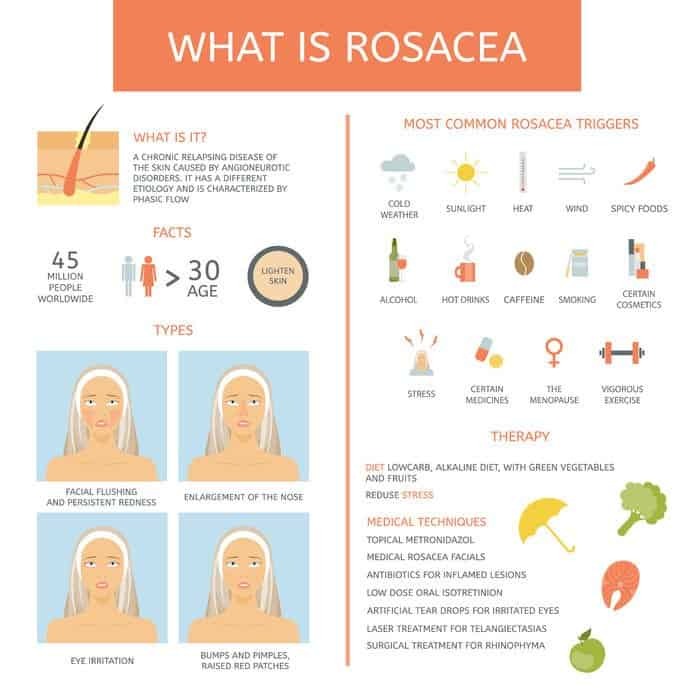 While most people relish the idea of spending time outdoors when it is warm and sunny, rosacea prone skin is certainly not a big fan of sunlight. In fact, sun exposure is the most likely trigger of rosacea. So, what part of sunlight does your skin not like? Both the heat and the sweating that it causes. Anything that raises your blood pressure or body temperature makes the blood vessels in your face go crazy and this is what causes the flushing and the eventual inflammation. So, it is crucial not just to keep the heat in control but also to get a handle on the negative reaction of your vascular system. Sunscreen is, of course, a necessary part of the protective strategy. 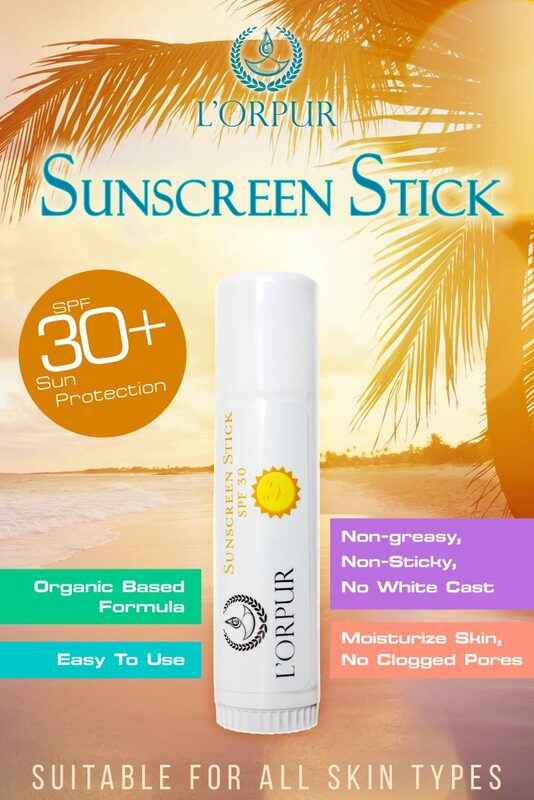 A natural formulation that contains physical sunblocks like zinc and titanium dioxide will help more than a chemical preparation. Apart from this, you will also need to have a cooling mist/gel handy. Any soothing facial mist will do as long as it does not contain peppermint extract/oil, natural or artificial fragrances and chemical preservatives and colors. If you want to experiment with a DIY formulation go for neroli or rose hydrosol mixed with thermal water in 1:1 proportion. Add about ½ teaspoon of green tea extract and ½ teaspoon of grapefruit seed extract to 500 ml of the blend. Spritz all over your face while keeping your peepers closed at the first sign of body heat or sweating. 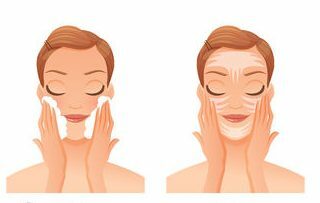 Keep the liquid on your face for about a minute and then pat dry your skin using soft tissue paper. Don’t forget to dab on some more sunscreen after this if you are going to remain outdoors or a light moisturizer if you are working indoors. This comes a close second on the list of triggers because the more stressed you are the more cortisol you will have in your system, which in turn will raise your blood pressure and heart rate. Although stress cannot be helped with topical formulations, tai chi, meditation and the calming fragrance of chamomile, lavender, frankincense, vetiver, geranium and ylang ylang can keep things and life in perspective. If you don’t want to invest in all these essential oils, go for a calming or stress relief blend that combines all or at least some of these for you. Spring allergies, summer heat, autumn winds and winter chills will all unleash disaster on your skin. While we have little control over Mother Nature’s moods, we can take preventative action. You already know how to handle summer heat but if you want more protection, use aloe gel mixed with sea weed gel and coriander/parsley paste on your skin after spending time out in the sun. Apply in a medium thick layer and keep on your skin for 15 minutes before washing it off with room temperature water. An anti-inflammatory lotions/serum that contains niacinamide, cucumber extract/water, vitamin E, sqaualene and other such ingredients will help against windy weather. In winter, go with a super moisturizing skin balm/stick that will protect your skin from the plunging temperatures. Short of avoiding booze and java, there is very little you can do to prevent flare ups caused by these beverages. If you must indulge yourself, go for a lighter concoction instead of neat liquors and high-caffeine content preparations like espresso. Again, there is little that you can do topically to stop the flushing caused when you eat food that is too hot or too spicy. The only way to remedy the redness is to ensure that the environment around you is super cool, as in you are running the air conditioner at full blast when you enjoy spicy delicacies. Workouts can literally work wonders for your skin but exercise or any physically strenuous activity ranks pretty high on the list of rosacea triggers. Of course, this does not mean you should turn into a couch potato. Hey, I’d deal with a bit of flushing any day over serious health concerns like diabetes and cholesterol. Just keep your cooling spritz (recipe above) handy to counter the effects of the rise in body temperature that comes naturally after a good workout. If the redness persists, soak chia seed meal in cold almond milk or coriander seed water till gelatinous and apply as you would any gel mask. Wash off after 15 minutes. Both these symptoms call for medical intervention but natural remedies can be used as an adjunct. The best part is that they may actually improve the effectiveness of prescription products and help in eventually weaning your skin off them. A beta hydroxy acid cleanser will certainly help to deal with cystic acne, whether caused by rosacea or not. So, use a salicylic acid cleanser every 3 days if you have mild cystic acne, every alternate day if you suffer from moderate cystic acne and once a day if you are prone to frequent and intense breakouts. Apart from this, use a spot treatment of mustard seed and sesame seed paste on the pustules. Alternatively, try a blend of 1 tbsp hempseed/jojoba oil mixed with 3 drops of tea tree oil, 1 drop oregano oil and one drop of ginger/cinnamon leaf oil. This blend can be applied on a wider area than the mustard seed paste. But, you should only keep it on your skin for 2-3 hours. Wash the paste and the oil blend off with warm (not hot) water/tea. For redness, inflammation and acne that is spread over a wide area, like both cheeks, use a paste made by mixing almond/sesame milk, ¼ tsp licorice root powder, a pinch of turmeric, ½ tsp plantain root powder, ½ tsp coriander seed powder and 1 tsp pomegranate peel powder. Only use on the affected areas and keep it on your skin for about 15 minutes, without letting it dry completely. Every time you see a dry spot dab on some almond milk to wet it. Wash off with warm tea or water. You’ll need to do this 1-2 times a week to get visible results. Even if you use makeup sparingly, at the end of the day, your skin will still have harbored a significant amount of environmental gunk. To deep clean your pores, you can either use a creamy, foaming cleanser or a blend of hempseed and castor oil (3:1). In both cases, apply the formulation with light handed, upward strokes. 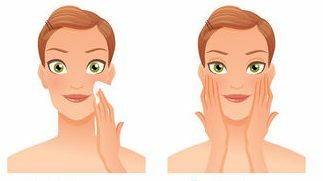 If using oil, leave it on your skin for 5 minutes and then remove with a soft cloth using pressing motion (no wiping). You can use warm water or an infusion made by boiling together parsley, fennel seeds and basil. All of these are natural and potent antihistamines that will prevent allergy flare-ups and keep your skin calm. Pat your face dry with a soft towel. A product that contains niacinamide, hyaluronic acid and botanical extracts of green tea, feverfew, spirulina, ginger, honey suckle, bisobolol, algae, red tea and peptides will be truly beneficial for your skin. Of course, you won’t find all of these in one product but as long as your serum contains, peptides, niacinamide and 2-3 of the botanical extracts mentioned here, you can be sure that the formulation will prove to be right for your skin type. As always, apply by gentling pressing the serum into your skin with your fingers. 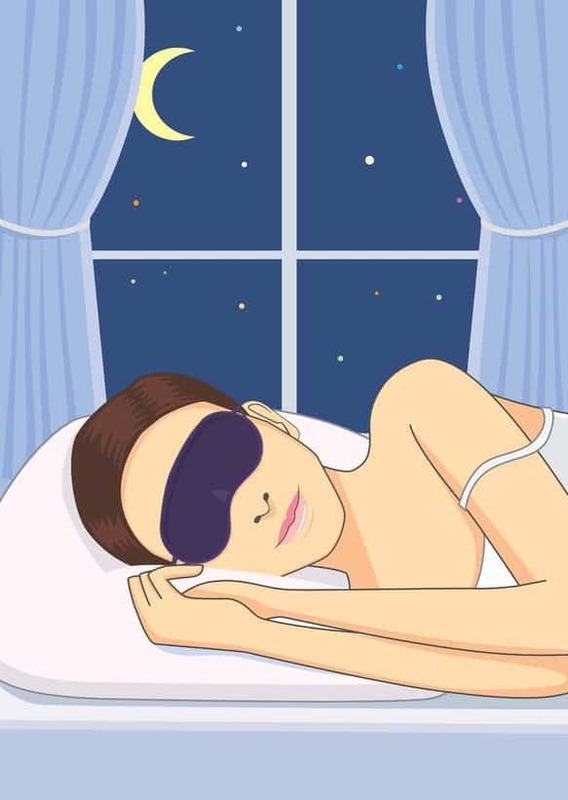 Since almost 50% of the people who suffer from rosacea also complain of dermal dryness and this only gets exacerbated with age, using a moisturizer at least at night will certainly help. Go for a facial oil made by using non-comedogenic carriers like rosehip seed, hempseed, pumpkin seed and evening primrose. If using a commercial product, ensure that it is meant for sensitive or rosacea prone skin. To apply, wait for 10 minutes after the use of the serum and then use the same “pressing” technique as you did for the serum. A clay mask if used properly can greatly benefit rosacea skin all thanks to the profusion of minerals in it. 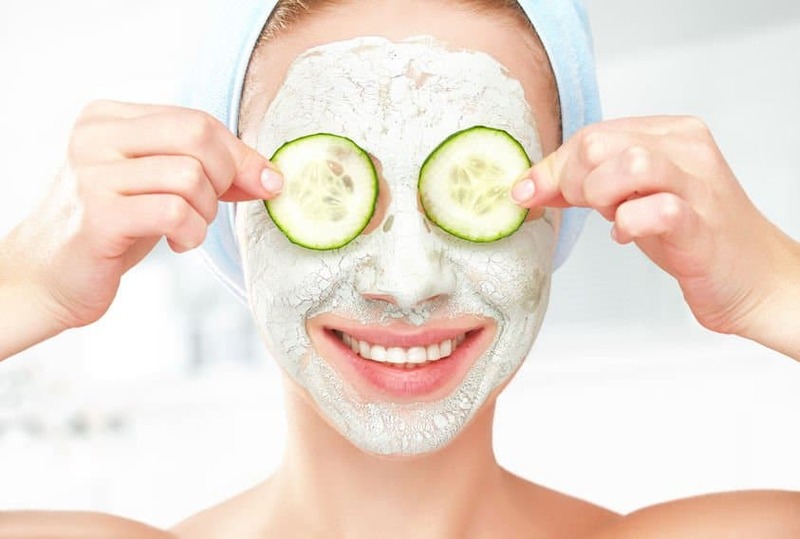 Your skin needs all the zinc and selenium it can get, so if using a DIY mask use French green clay as the base and thermal water to mix the dry ingredients. Once a week face mask application will suffice to keep your skin clean and soothed. But, it is important to not let the mask dry or crack on your skin. Keep it on for 10 minutes and use thermal water to wet any dry spots that develop. To wash, wet the mask and wait for a minute; so you can take the mixture off your skin without any rubbing involved. Pat your skin dry with a soft towel and moisturize immediately. Also, use a hydrating or fruit based mask once a week. Depending on the severity of your rosacea and any other underlying dermal issues, you may have overly oily skin or distinct flaky patches. In both cases, a good dose of hydration will help your skin. There you have it, everything you need to know about taking care of rosacea-prone skin. As usual, simply hit reply and I’ll answer any questions you may have. Have Oily Skin? With The Right Skincare Routine You Won’t Have To Worry About Pimples And Blackheads! Use The Right Skincare Routine To Do Away With The Zits And Dryness Of Combination Skin! The Right Skincare Routine For Normal Skin! Dry Skin Weighing You Down? Try This Skincare Routine That Actually Works! Just wanted to say that I got in touch with Olivia previously as the 28-day plan was not doing it for me. (my dr had given up on me due to severe rosacea which he thought could not be treated). Olivia suggested I add galbanum and carrot seed EO in the recipe. It has worked extremely well for me and have not had to deal with any symptoms since. So the recipes do in fact work very well, just make sure you get good quality EO to start off.